Many of the readers might wonder what Ravi Shankar has to do with a website exclusively dedicated to the Beatles. If you have read the two articles, (George and The East and Concert For Bangladesh), which concered the relationship of George Harrison with Asia, especially India, then by this time you know who Ravi Shankar is. He was a close friend of George Harrison and taught Harrison to play sitar. Maybe to the west he is known because of being a close friend of George Harrison, or influencing the music of the Beatles with his Indian music and musical instruments,but in the Indian subcontinent, he is known as the best musician of our time. He is respected highly in India and also he has composed many tunes which are extremely popular. He has had continuous and unabated fame and popularity for over 40 years and there is hardly any musician in any part of the world who could sustain popular appeal for such a long time. However, this success came after years of struggle, hard work and dedication. He has taken Indian classical music to a new height with his contribution as a performer, composer, teacher and writer. Ravi Shankar was born into a Bengali Brahmin (considered to be uppermost caste in the Indian Cast system) on April 7, 1920 in Benares of North India. However, his family orignally came from Kalia which is now in Bangladesh (my native country too). His mother died when he was a child and as a result he had to suffer a lot by being deprived of the care of a mother. Music was always valued with importance in his family and this ensured adequate exposure of a musical environment for young Ravi Shankar. In 1930 his family moved Paris. This event brought the opportunity to come into close contact with the western music. After being there for 8 years Ravi Shankar came back to India in 1938. He became the apprentice of the most famous sitar player of the time, Ustad (The meaning of the word, Ustad, is master) Allauddin Khan(also originally from Bangladesh). In the Indian subcontinent, the tradition of master and disciple in music is perhaps as old as the history of music itself. Ravi Shankar was the brightest student of his master and after finishing his apprenticeship he started his own career as a professional musician. The first days of his career were not so easy or smooth. He had to work in movies and radio in order to make a living. Slowly he started to gain a reputation for himself and his music started to become popular. Although he made several visits to the west, it was not until his association with the Beatle Superstar, George Harrison, that he received wide recognition to the audience of the west.This friendship between George Harrison and Ravi Shankar turned out to be a lifelong one, and it benefited both of them enormously. George Harrison could learn sitar from him and more than that he learned a new vision of life, the Indian way of life which he continued to live until his death. On one hand, Ravi Shankar got a true and dedicated friend in George Harrison. George Harrison acted selflessly to introduce and make Ravi Shankar popular to the western audience. In fact it was not just the personal lives of these two great musicians that were influenced but their music too. George Harrison created a fusion between the western and the Indian music and musical instruments. This made him a unique musician of his time. On the other hand, being influenced by George Harrison, Ravi Shankar could do one great thing. Before him, no Indian musician could have attracted the western audience in such large scale because they tried to be too much traditional in their music. But Ravi Shankar realized that this way Indian music will never be acceptable in the west. He created his own music. He had to suffer much criticism from the Indian music critics who did not like his way of breaking the grammar of Indian music. But Ravi Shankar had the necessary skills to create brilliant pieces of music which would entertain both the east and the west. He taught the western people to appreciate music from heart. He taught them to feel the beauty of music in their heart. As a result he could take Indian music to the west successfully. His friendship with George Harrison also produced the first charity concert for humanity in 1971, Concert For Bangladesh . Ravi Shankar has won my awards including several Grammy awards. Ha has been awarded the highest honor of India. Moreover, many universities have conferred honorary doctorate degree to him. He is still living today and performing his music in many countries around the world. In India, He is a living legend. "Ravi Shankar, musician to the world - whose rare genius has opened the ears and minds of millions to the wondrous aesthetic of India's ancient musical tradition - adored musical ambassador whose incomparable artistry has created bridges of understanding among the peoples of the earth." At the young age of 21, Anoushka Shankar has shown herself to be a unique artist with tremendous talent and understanding of the great musical tradition of India. Anoushka is the only artist in the world to be trained completely by her father and legendary sitar virtuoso and composer, Ravi Shankar. At age 13 she made her performing debut in New Delhi, India, and began assisting her father at all his concerts worldwide. That same year, Anoushka entered the recording studio for the first time to play on her father's recording, In Celebration. Two years later she helped as conductor with her father and George Harrison on the 1997 Angel release, Chants of India. As her sitar career continues to blossom, she is poised to carry forward her father's legacy as one of the most creative and influential figures in the music world. In recognition of her artistry and musicianship the British Parliament presented Anoushka with a House of Commons Shield in 1998. She is the youngest as well as the first female recipient of this high honor. In November 2002 Anoushka Shankar conducted a new composition of her father's at the highly anticipated "Concert for George ," in honor of the late George Harrison at London's Royal Albert Hall. Ravi Shankar's beautiful new composition, Arpan, featured a guitar solo by Eric Clapton and performances by 43 musicians playing Indian and Western instruments. Ravi Shankars other daughter, young superstar singer Norah Jones broke all attendance records at Tanglewood last summer with her live Piano Jazz session with host Marian McPartland in Seiji Ozawa Hall. Highlights include "Mean To Me" and Jones singing her original lyrics to Duke Ellington's "Melancholia." The official site for the singer who majored in jazz piano, and also plays soul, blues, and folk-based pop. Audio files, show dates, photos, and news. Check it out here: Nora Jones. For those who are unfamiliar with Ravi Shankar and the instrument synonymous with his name, explaining the cultural significance of his life can be a time-consuming task. Luckily, this is made easier by first noting both George Harrison and Brian Jones were his students, and through Shankar’s guidance learned how to play the sitar (you recall the Rolling Stones’ “Paint it Black” or the Beatles’ “Norwegian Wood?” Yep, that’s the sitar and those songs wouldn’t have happened without Mr. Shankar’s guidance). In turn, through the Beatles, the philosophy, music and fashion of the East became adopted by the '60s peace movement, becoming icons of that era. Famous throughout India and Europe, Ravi Shankar made his direct mark on American pop culture in the 1960s and early ‘70s, playing the Monterey Pop Festival, Woodstock and the Concert for Bangladesh. A lifelong devotee of music, Shankar is recognized as the world’s foremost sitar virtuoso. (In addition, he is also the father of Grammy-Award winning singer Norah Jones, as well as sitar disciple Anoushka Shankar.) The honorable Ravi Shankar recently embarked on his 85th birthday tour, and the Synthesis had the opportunity to ask him a few questions. Hello Mr. Shankar. Before I ask you a few questions I wanted to first state that I consider this a great honor to speak with you. How are you feeling today, how is your health? Fine. We have been performing a lot in Florida, a few places, New York and New Jersey, and we flew over yesterday. We are in San Francisco today, and we go by bus tomorrow morning. We have tomorrow in Napa. Do you consider touring to be difficult? In your opinion, what has living a life devoted to playing music taught you about human beings? Well [laughs] that is a very deep question. Ah…music to me dearly means the most, ah, more than anything in the world for me. And it has made me really more sensitive to all the pleasures and pains, everything that I experience within me or around me, and made me much more sensitive, I think. What role, if any, will music play in achieving world peace? [laughs] I don’t believe it can play any role directly. You know, playing Beethoven’s Fifth or a raga may not stop a crowd of people who are mad and fighting. But I think in general, music is one thing that can bring peace of mind to the listener. Unfortunately, all of the political leaders and people who really are at the helm may not be that musical. If they were I think that it would have been much better. But, you know, it is not like anything that directly you can play music and stop fighting or anything like that, or make a person calm down if he’s violent. But, on the other hand, they are experimenting in hospitals and everywhere, music therapy you know, where they hear different type of music to cool people down when they’re not feeling well. It has effect, definitely. Sorry to start off with such philosophical questions. One thing that I was wondering is do you ever listen to Beatles records? To tell you the truth, I have never been listening to a lot. Whenever it was played, somehow, I have heard two of their songs, but I’m not completely knowledgeable about their music. The thing, the few that I have heard [are] the personal ones of Paul and George and John. I was wondering this because Indian classical music has influenced Western pop music, but in turn, has pop music influenced Indian classical music? No, I don’t think so. Of course there are people who are very much into fusion and working on these experimental things and commercial things to sell the record, and more of them are gimmicks, actually. But some of them are done by very talented people, you know. It all depends on who likes it and how much it sells. That’s what matters as far as they are concerned. And that’s exactly the state of music. It has been a very great experience in my life, as a guru and a father both. I’m very proud of her, she is a fabulous musician, and it’s such a joy to perform along with her. How do you feel about your daughter Norah [Jones]? That’s another thing that I am very proud of. I love her very much, and though she’s not singing Indian music or anything, it’s beautiful. Whatever she does, it comes out so…it touches you. Who do you consider to be your personal heroes? Ah…[laughs] Not very many present ones, unfortunately. But the great poet Rabindranath [Tagore] and many people who are far gone, you know, people like da Vinci, Einstein, you know. They can be just from different areas, but they have been great musicians like my guru [Ustad Allaudin Khan] was, and like Bach, Beethoven, Mozart, all this. You believe in reincarnation, correct? I mean, somehow being born a Hindu and having been raised as one with all of our religious and philosophical beliefs and things, I do, really. I’m sure that it had something to do with art. Maybe music only, but all forms of art. And I feel very strongly but, you know, it is one of those things. What do you hope to become next? Again, I would like to pursue — provided I can keep this memory of what I have accumulated in this life [laughs] — if I can carry it on, certainly I want to be a musician. Music seems to be working out for you pretty well. Sitar master Ravi Shankar is a legend of Indian music at home and abroad. The era when he taught the Beatles and resisted the overtures of the hippie movement is long gone. More recent disciples include many young Indian virtuosos and Shankar's daughter Anoushka, who excels in traditional ragas and in the contemporary, globalized sounds of her new album ''Rise." 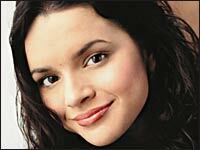 The other famous Shankar daughter is singer Norah Jones. Shankar, still an active and passionate musician at 85, comes to Symphony Hall tonight with Anoushka and a passel of other musicians. He spoke with us from New York a few days ago. Q: Has Western appreciation of Indian music changed over the years? A: It has changed so much. When I started in the mid-1950s, just a small audience was curious about Indian music. But none of the musicians had any concept of the Western audience. They would do the same thing as in India, playing Darbari Kanada [a very slow raga that can take hours to unfold] and so on. We needed to edit, like in film. We already had this system in South India, of starting a concert with shorter items. I started performing in that manner. And I became very popular, which was good because it was attracting more audience. After almost 11 years, George Harrison became my student -- I'm sure you know that whole story, and you know that I had a lot of problems with that. But I didn't sell [out] -- I didn't become raga-rock. I was very strong about preserving the traditional form. A: And the whole thing changed gradually. Now all these great young musicians are coming more and more. But still most of them have 95 percent Indians in their audience. I've made it a point that my audience is always [heavily] local. The difference now is that you know people are interested in India for the spiritual side, and they are much more open to the fine points of the music. Q: A few years ago, you held a concert to mark your retirement from touring. What inspired you to come back? A: This time is different. I've got 10 wonderful musicians with me, and they will play some of my old and new compositions in the first half, with my daughter Anoushka on the sitar. After the intermission I will play, with Anoushka. Q: Tell me about some of the musicians. A: Ravichandra Kulur is a fantastic flutist from Bangalore. Ramachandra from Madras is a fantastic violinist. We have a young veena player who lives in London, Hari Sivenesan. My very advanced student, Parthosarathi, is playing the sarod. Q: You have two musician daughters who have become celebrities in their own right. A: First of all, I am really grateful and happy for this double blessing. As far as Norah is concerned, she is completely American. She was born here and raised here, and grew up with jazz, country and western, and everything, and she is doing the music she loves. Anoushka is different because from the age of 8 she was with me, and studied with me. She is extraordinarily talented -- not just playing the sitar but writing, conducting, even modeling, in everything she does. And when she performs, I feel she is completely what I gave her. Though of course everyone has their own individuality. Q: Do you draw inspiration from her work? A: Not her work, but when she performs with me I become very inspired. I get into a very special height of creativity. Q: After all these years and accomplishments, what motivates you to work every day? A: I guess it is music itself. It is part of me, it's everything that is important to me. Going on 86, it's what has kept me alive.